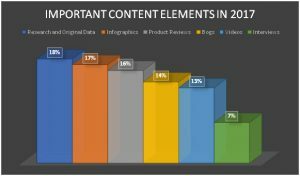 The five content marketing strategies currently defining 2017 are social media, the use of the mobile website, content diversity, using research/data, and email. There is more information about each of these topics in the sections below. There are many different types of advertising. 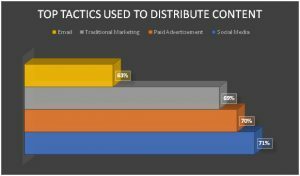 Paid advertisements and Social media are right at the top of the list for various tactics used to distribute content, as shown in the chart below. The reason that social media is the number one way to distribute content is that people put more faith into the words of their family and friends than they do into any other source of information. Social media sites, such as Facebook, have quickly become the primary form of “word-of-mouth” advertising. Individuals not only like and share things on their Social Media accounts; but in today’s world, Social Media is used by many as their primary form of communication. Businesses utilize marketing strategies to be successful. It is important to ensure that you are engaging your users. Most businesses have a diversified client group. The reason that your 2017 marketing strategy should include diversified content is that individuals are diverse. The same type of content for your marketing strategy does not apply to everyone in the world. It takes different content to engage and entertain diverse populations. The more diverse the type of content for your marketing strategy, the more is the likelihood for successful strategies in 2017. The world is going mobile. It is a fact that every business is going to need to come to terms with if they want to succeed. Individuals like to have information available to them while they are on the go. When information isn’t easy to pull up, individuals tend to look elsewhere. 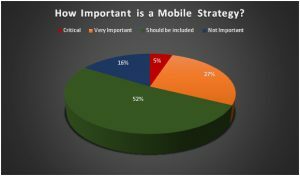 For this reason, it is critical that a mobile websiteis part of your 2017 marketing strategy. This is one of the most efficient ways to promote your site. The following chart shows the percentage of B2B marketing executives in the world that find a mobile website is critical to your marketing efforts. The days of randomly calling consumers are over. Thanks to social media, businesses now have a harder time controlling their reputation. The good news is that we live in a technological world. The reason that this is good news is that email is making a comeback. It is important that marketing efforts include email to distribute content. More and more individuals are using and checking their email every day. Email is also a good way for you to follow consumer trends and use it to your advantage. You can send out newsletters to engage your target audience. Emails can significantly assist in ensuring you have developed successful marketing strategies in 2017. Another important element that should be included in your 2017 marketing efforts is research and data. Individuals do not want a lot of fluff in articles. They want articles that include some investigation and data. They want to know that you know what you are talking about. The chart below shows the importance of different types of content to use on your website. Your marketing efforts should make sure that you are doing active research on your client population and using data to your advantage. Research and data mean more than just incorporating it into the type of content for your marketing strategy. You want to ensure that your 2017 marketing strategy includes using consumer data to your advantage. 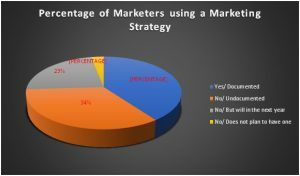 This means that you need to research what is and is not working for your 2017 marketing strategy and adjust accordingly. You need to pay attention to the trends and patterns of your target population. This is one of the main elements required for marketing strategies to be successful. Your marketing strategy can make or break your company. It is important that your strategy for marketing is individualized and diverse at the same time. You want to make sure that you are using the most efficient ways to distribute content. Your 2017 marketing strategy should be used to promote your website. Promoting your site helps promote your business. Your marketing efforts should be as diverse as your content for your marketing strategies to be successful. There is more than one type of content for your marketing strategy. Your 2017 marketing efforts need to include diverse content. Successful strategies in 2017 are aimed at engaging and entertaining target audiences to promote loyalty in consumers and growth for the business. In 1732 Benjamin Franklin started printing and distributing “Poor Richard’s Almanack” to promote his written business. That was one of the United States’ first and best examples of content marketing, used by one of the ultimate innovators and inventors we’ve ever seen. Just as he invented the lightning rod to attract lightning (by the way, he never applied for a patent for any of his inventions), he used his publication to attract buyers. Over the years, content marketing has grown to become a staple for businesses intent on connecting with consumers. Franklin would nod approvingly at the increased scope of intricate consumer outreach employed now. He loved a good story – as do we all. The best content marketing tells that good story and adds bells and whistles to enhance its message. Franklin had an audience generously estimated at 700,000 (man, woman, and child) to play to back in the day. Facebook itself today has 1.13 billion daily active users. The numbers have skyrocketed and the techniques refined over the years as technology blossomed. Companies have found that the best way for people to become hooked on its products is to have a long-term narrative. Keep them coming back for more. The modern attention span is short, so it is imperative to draw the consumer in and for them to want to hang out for a while. Email – You have Mail! It’s been done before, right? But it’s making its comeback. Companies already have your data – and they want to make something out of it. Now they’re making their emails relevant by using that info to inform you of things you want to know instead of mindless spam. The average click-through rate for emails is roughly 25%. Different factors increase that rate. Emails that use the consumer’s first name in the subject line have a higher rate. Emails that say “Thank You” in the subject line have the highest above-average level of engagement. 86% of consumers welcome monthly promo emails from companies they already do business with. 2.Video – Lights, Cameras, Action! 98% of info transmitted to the human brain is visual. Visuals are processed at a rate 60,000 times faster than text. Visuals stay in the long-term memory for a longer period. Visuals cause a stronger emotional response than text and can be more meaningful to the viewer. If you want your story (and product) to be more impactful and memorable to your audience, a video is your way to go. The big guy (Facebook) is featuring more video sharing and videos are easier to produce than ever. Ride the wave! Tablet or smartphone access over 66% of emails. 95% of smartphone users use their device to look up local businesses to call or visit. Over 2 Billion mobile users will make a commerce transaction by the end of 2017. It’s projected that by the end of 2018, 27% of e-commerce sales will take place on a mobile device. To make use of the trend, make the process easier – apps, fewer clicks, buyer information carried over from platform to platform. Create an entertaining and welcoming virtual environment for your customers. Celebrity endorsements are a dime a dozen. It’s either their product or they’re being remunerated. The message might be entertaining, but can you take it to the bank? Enter the influence marketers. Their word might not be gold, but it will have enough gold-like characteristics to sway. Whether it’s a leader in their field or someone giving an honest review, their word goes a longer way with the consumer. Experts giving a video review on their blog or podcast can be the deciding factor for many potential buyers. They want facts to cement their decision. How many times have we heard the hype and then heard the consumer reviews and got a different story? That’s what we’re looking for, a real story – and enough true stories and we listen. If the video doesn’t get them, maybe the galleries, podcasts, or infographics will. Everyone has different tastes – and different things catch different peoples’ eyes. Hit them on all fronts, and something will click and draw them in. Even if it’s mostly the same information, the delivery mechanism makes it a different animal. Different content can also apply to effectiveness on various platforms. Tailoring towards a video presentation will, of course, be more suitable to Facebook and YouTube than Pinterest or Twitter. Flashy images with brand placement are right up Facebook and Pinterest’s alley. Hit the consumer where they live and where they browse. Different demographics using various sites – adapt and diversify your message to take the advantage of all your audiences. You know the trends, but how do you take advantage of them? Spike Native Network at spike.com.au is the Content Recommendation Platform for business pros. If it’s worth doing, it’s worth doing right. Get your campaign underway today with Spike and find yourself in the Winner’s Circle tomorrow. US technology company Stripe has announced that it has made its third acquisition in March 2017 with Indie Hackers, a knowledge sharing community for independent start-ups. In an attempt to build and grow relationships with the ever-expanding independent start-up scene, US digital payments company Stripe has recently acquired Indie Hackers for an undisclosed sum. With Stripe’s revenue upwards of $111 million and the current valuation of around $9 billion, the acquisition seems to be a move towards increasing its customer base. You may not have heard of them, and that’s because Indie Hackers was founded less thana year ago, in July 2016. Courtland Allen, the founder, set out to create a space where both entrepreneurs and successful business owners could come together in a community for advice and inspiration. With business increasing and recently bringing in a reported $6,000 per month, Allen found his attention was being diverted away from producing content and increasingly towards filling ad inventory. Why Buy A Knowledge Sharing Community Company? So, what was the interest for a digital payment company in acquiring a company like Indie Hackers? Stripe, based in San Francisco, already has a significant percentage of new companies choosing their product. Their aim in the acquisition of Indie Hackers, they say, is not to increase that fraction but to increase the overall number of sales. Stripe has received more than $355 million in funding, with names such as Elon Musk and Sequoia Capital contributing to that fund. The company provides payment processing services for mobile and online payments. It supports credit card payments in more than 135 countries. The online payments firm understands that if it supports and nurtures smaller, knowledge- sharing communities, it will have a knock-on effect. It will ultimately filter through to Stripe’s potential customers. Courtland Allen now goes by the official title of ‘Indie Hacker at Stripe’. Now that Stripe has relieved him of a financial burden, Allen can continue with his first intentions for the entrepreneurial community. Soon, the team plans on developing the Indie Hacker community and working on more original content for the website. Stripe has an aim to make it easy for entrepreneurs to develop and nurture their businesses. And this is where Indie Hackers will turn up. In turn, Stripe will also benefit as more customers will sign up for their product. No doubt, this acquisition has created a win-win situation for both companies. India’s largest online automobile marketplace is driving forward with visions to globally expand the car buying and selling sector with a huge investment planned in 2017. Indian company Droom is accelerating forward at an impressive speed as CEO Sandeep Aggarwal announced to PTI plans of a $60 million investment for 2017. Aggarwal is keen to point out that these funds are not to plug losses in the company. Instead, this money will let Droom “dominate the market in future with new products and enhanced market share”. Starting back in April 2014, in less than two years, Droom became India’s largest hyper-local automobile marketplace. Having a presence in 500 cities across the country, it is currently the fifth largest e-commerce company in India with a workforce of just over 200 employees. Speaking to PTI, CEO Sandeep Aggarwal declared his desire to raise $60 million this year. This investment is meant to expand the car buying and selling platform out of India. Droom’s visions for 2017 are to set up operations first in Indonesia followed further by South East Asian countries shortly afterwards. Last year Droomraised Rs. 200 Cr from a mixture of Chinese and Japanese investors such as Beenext and Digital Garage. That was the fourth round of fundraising done by Droom. The current round will, therefore, be the fifth and their largest till date. Aggarwal has made recent trips to Hong Kong and China. He is quoted as saying “there has been significant interest from China” and the company also did an “investor day in Hong Kong”. It has not yet been confirmed where the money is coming from or who the investors might be. But with an estimated revenue of $52.7 million, it is clear that Droom is firmly in the driving seat racing forward, which will surely attract some lucrative investors both new and old. How will this investment impact the revenue? The massive investment will fuel Droom’s rapid expansion further East in Asia. These foreign enterprises hopeDroom to bring 15-20% of their revenue by March 2019.Eventually, the percentage will go up to 30-40%. Given the amazingly large potential customer base in India, Aggarwal states: “the local Indian market will continue to have the greater share of our revenues in the coming years”. Along with operating in Indonesia, Droom is also considering a secondary base in the country. Where Next For This Rapidly Growing Company? Currently, the company is accelerating at a rate of 350% year on year. Compare this to India’s e-commerce growth of 20% year on year. The goal is to achieve $1.2 billion in GMV (Gross Merchandise Value) by the end of March 2018. GMV currently stands at $400 million. Recruitment is something that requires a lot of networking and involvement. It can be a hard task to recruit the right candidate for a company, but there are various innovative apps to help make the process easier. With everything going online these days, there is no dearth of the different ways in which the internet is being used for recruitment. According to Jobvite, around 94% of the recruiters plan to use or are already using the social media for recruitment purposes. Another statistic shows that 43% people look for jobs through their mobile devices. So, let’s get to know what mobile apps recruiters can make use of to hire the right talent. It is observed that more than 50% of millennials use their mobiles to search for jobs. LinkedIn is the most popular platform for recruiting after Facebook. It allows you to see a variety of potential candidates to whom you can talk to, and stay up to date. According to Career Builder, almost 54% of recruiters stay engaged with former recruits who did not get hired through them. This app also allows employers to see when applicants edit their profiles. It is best suited for on-the-go searches and allow you to send quick notes or search for a particular profile. Sorting candidates is another feature. The Linkedin Recruiter app is available for free for both iOS and Android users. Monster is the next favorite app after LinkedIn. 25.3% of visits to this site come from search engines. Employers can post new jobs as they become available and share them. They can shortlist applicants and contact them through the app itself. Both iOS and Android users can make use of this app, and it is absolutely free to use! As the name implies, this app is ideal for conducting interviews. It is customizable, and that’s why it is easy to work with. According to MRI Network, 48% recruiters agree that they take about 3 interviews per candidate. Interview Assistant allows you to design your own interview. Employers get to pick which questions they want to ask. You can choose from a list of 250 questions, or create your own. Employers can also track multiple interviews and review them. It is also possible to create a custom interview template. A potential drawback to this app is that it is only available for iOS users although it is free. This app operates on a database. Subscribers have free access to applicants and applications. Employers can review applications and can also find candidates and contact them. Another perk of this app is the fact that the number of searches that can be made is unlimited. Research shows that around 44% job seekers spend about 1 to 5 minutes on an average to read a job post on TheLadders app. There is one drawback to this app, however. It is only available for iOS. Thus, Android users cannot download this app. This app is meant as a sourcing tool. It links to social networks, such as Google+ and LinkedIn. As per Career Builder, around 18% job seekers search for recruiters on social networks. This app allows you to save and share searches. One great aspect of this app is the fact that it is customizable. Employers can customize searches. Customizing searches includes the selection of job, location, and keywords. When keywords are entered, it delivers search results through Bing. This app is available for both iOS and Android users. It is available for download for $2.99. As per the Jobvite Recruiter Nation Report 2016, up to 19% recruiters are already investing in creating a mobile-friendly job website. No doubt that finding candidates through mobile apps and websites is the trend for 2017! Why should you have specialized shoe storage? Let’s face it; you sneakerheads don’t drop over $100 on a pair of Nike Air Jordans, old-school Adidas sneakers, retro leather Pumas or comfy Vans, just to wear them for a week and then move onto something else. Well, not unless you’re Kanye West and you have millions of dollars to spare. For most of you kick connoisseurs out there, you want to make sure that your sneaker investments stay fresh all year round, and that every time you put them on, it feels like you’ve just bought them new out of the shop. Whether your shoes are fabric, leather or suede, looking after them means two things: putting in the work to keep them clean and well-maintained, and having a high-tech storage solution for your kicks that not only looks stylish but also keeps them in optimum condition when you’re not wearing them. Humidity, heat, sunlight and dust all create problems for your shoes if you allow exposure. White soles become yellow and oxidized, the material becomes stiff, and those natural creases and folds you get in your sneakers from wearing become cracks and fissures over time. The lifespan of a poorly cared-for pair of sneakers can be as little as one year, while a well-maintained and stored pair can last you for three years or even more. Given how much you spend on a pair of sneakers, would you not want to get all the possible extra mileage out of them that you can? Now, of course, any storage for your kicks is better than no storage, and all of them have their advantages. A simple rack keeps them off the ground, allowing your shoes to breathe, and freeing up space in your crib – whether it’s a bedroom or a lounge – for all those other important things, like your beer fridge. A transparent cabinet or stack of plastic boxes goes one step further and turns your sneaker collection into not just something you wear on your feet, but an impressive decorative piece. This piece allows you to fit your collection into small spaces; why have a collection of sneakers if guests can’t come around and admire them when they’re not on your feet? ShoeBoxOne takes an innovative and high-tech approach to storing your sneakers. Our shoe boxes are made from high-quality transparent plastic and can be stacked on top of each other up to 8 boxes high. In addition to this, customizable LED under-lighting makes your sneaker collection look even more impressive. But it’s not just all about looks. Our boxes can be vacuum sealed to prevent oxidation and yellowing. Sensors within the boxes can alert you about temperature and humidity levels. And all of this can be synced up with a smartphone app allowing you to care for your shoes remotely. Subject: high-tech shoe storage for expensive sneakers. Intention: Marketing and brand awareness, emotional connection. Subtly mention the client and what they offer without hard selling. Sneaker lovers around the globe will be nothing short of ecstatic when they finally discover the perfect shoe storage compartment they’ve been searching for their entire lives. As someone who collects shoes, who worships the very ground they walk on (pun intended), it’s not just purchasing the freshest new releases and showcasing them on their feet, it’s about showcasing their collection in their allotted storage area too. With ShoeBoxOne’s brand new product, the shoe storage game is as good as revolutionised. We’ve thought outside the box with this one! As an avid sneaker collector, have you ever found yourself staring at the pyramid of shoes over in the corner of your room, still in the original boxes that don’t allow you to observe their beauty at every second of the day, only to feel a bitter sense of disappointment? Well, with our new product, that feeling is as good as gone. Now your shoe pyramid can be worshipped from all angles, at any time of the day. Our new shoe storage compartment is to fashion what the Five Guys burger is to meat lovers – literal heaven on earth. With our shoe box, there is no need to wish you could see your sneakers because you can. The box is completely transparent, meaning you don’t have to drag yourself from the comfort of your bed to walk over to the corner and open up your box, to take a sneak-peek at your beauties. Let’s say, for instance; you just bought a pair of Jordan Horizon’s in red, well you can activate the LED light system in the bottom of the box and light the base of it up, so it matches the colour of your shoes, showing your babies in the best light possible. The LED panel has a broad range of colours to choose from and will match with the vast majority of the colours in your arsenal. As well as choosing the lighting by the colour of your kicks, the box also comes complete with temperature and humidity tracking and the option to vacuum seal, making it air tight. So not only can you make your shoes look pretty, but you can also keep them in the optimum temperature while sealing them off from all the dust they’re currently collecting up there on your shelf. And to top it off, all of this can be controlled and monitored via the ShoeBoxOne app, downloadable and accessible via your Apple or Android device. The game just got raised to a whole new level. As the world of sneakers is advancing, it’s about time the world of sneaker storage did too, and us guys over here at ShoeBoxOne feel like we’re doing just that. There’s no point in rocking the finest foot swag and not treating your babies to the most elegant storage available. That’s like organising your beloved grandma’s funeral and buying a cheap, nasty coffin. You wouldn’t do it. Get with the movement and store your beloved shoes in the type of box they deserve. The revolution is coming. Are you on board? For coffee lovers, coffee is the most important meal of the day. They believe that coffee gives them super powers. A cup of coffee gives them an unrealistic expectation of an increase in their productivity. Any coffee connoisseur can distinguish between hot brewed coffee and cold coffee. There are approximately 250,000 coffee growers in India. Maximum coffee production is in the southern states of India. Almost 80% of the country’s coffee production is exported. An interesting fact is that more than 90% of coffee production happens in developing countries like the countries in South America. Most coffee consumption happens in the industrialized economies. Well, that explains why it’s the favorite beverage of the world! The real difference between the two lies in its aroma and flavor. The former is strong and acidic while the latter is cool and refreshing. Although they have the same initial ingredients – coffee grounds and water, they differ widely in preparation and taste. Hot coffee is typically prepared by letting hot water drip over a coffee filter either by using traditional coffee pots or modern coffee making machines. They are filtered straight into a cup. As simple as that. Preparation time for hot coffee is relatively lesser. Cold brew coffee is made by soaking coffee grounds at room temperature or cold water and then letting it sit for hours or even days. Then they coffee is strained from the mushy solids. It is not possible to endorse one type of coffee over the other as it depends on the consumer.It is ultimately decided by the coffee enthusiast’s palate and the weather on any given day. If one wishes for less acidic, subtle taste than traditional coffee, cold coffee is his best bet. If he or she craves for a strong, aromatic flavor, the hot brew is perfect. Cold brew has a creamier taste to it. Its cool refreshing flavor makes it a perfect beverage for a hot sunny day. Hot brew coffee gives you the energy to pump you up on a lethargic day. Cold brew coffee must not be mistaken for iced coffee. Iced coffee is made by brewing hot coffee and immediately adding ice. Cold brew demands more patience than the hot brew during preparation. When coffee grounds are mixed with water, a chemical reaction separates them into coffee solubles and grounds. So technically, coffee beverages are a mixture of these solubles and water.Hot water pulls the soluble chemicals away from the grounds quickly, making them more volatile. This means they evaporate into the air faster and give the enchanting aroma. Coffee solubles have a remarkable decrease in their solubility at room temperature. This increases the brew time for cold brew coffee to many hours. If brewed in water, water temperature is kept below the ideal level to remove the acidic solubles. It must sit for a longer period to obtain a stronger brew. Cold brew stays fresh for a longer time. Hot coffee usually must be consumed within a day as otherwise, it becomes stale.Since cold brewing doesn’t volatilize the solubles, it has a blunt smell compared to hot drip coffee. For people who wish for an aromatic coffee experience, the hot coffee is the better option. Cold coffee costs more than its hot counterpart because it takes a longer time to prepare and uses up more coffee grounds. Now that you know the chemistry of hot and cold brew coffee, you will appreciate it better the next time you grab a cup of hot steaming java or deliciously rich and soothing cold coffee.Whether you are a conservative hot coffee fan or a contemporary cold coffee addict, as long as there is caffeine in your cup, all is well! Choose from an amazing variety of cold and hot brews! The best coffee blends are achieved keeping coffee chemistry in mind. Coffee is one of the most universally loved beverages. Most of our mornings begin in the same way – with a cup of steaming hot coffee that stimulates every inch of our being. No wonder it is loved by all, with over 2.2 billion cups consumed worldwide every day! Around 90% of the coffee in the world is produced in developing countries. South America, especially Brazil, is the leading coffee producer. India follows closely. A variety of caffeine options are served nowadays, keeping your passion for coffee in mind. Coffee blends are customized to satisfy your taste and budget. Cafes have started exploring new renditions of coffee by diversifying their menus.Freshly-roasted, handpicked, aromatic coffee from Karnataka and Andhra Pradesh, help make some great blends! Choose from The Best of Cold and Hot Brews! You have some amazing choices between two caffeine beverages – cold brewed coffees and hot brewed coffees. The two beverages are brewed keeping in mind their distinct taste profiles. Cold Brews Have Some Great Specialties! Try Out the Best of Hot Brews – Especially the South Indian Filter Coffee! Although both coffee blends use the same base materials, their tastes differ widely. Among the finest hot brewed blends, you must try out the South Indian filter coffee. These are chicory blended. A strong, dense and creamy offering! Hot brewed coffees have a brilliant aroma as well. The chemistry of hot brewed coffee and iced coffee is quite interesting. When the ingredients are mixed with water, the soluble components dissolve in the liquid. This gives the resulting blend a unique flavor and aroma. Coffee best dissolves at a temperature between 195 and 205 degrees Fahrenheit. Hence, hot coffee has a stronger flavor than iced coffee. When brewed with hot water, the soluble parts are quickly extracted from the coffee ingredients. They easily evaporate and release a beautiful aroma.However, the hot water might cause the coffee compounds to oxidize. This generates a bitter taste. If you are not a fan of a strong taste, iced brews are perfect for you. Oxidation happens in iced brewed coffee as well, but very slowly. It does not turn acidic or bitter easily. It tastes more refreshing and stays fresh for a longer time. The temperature of the cold water is way below the heat required to draw out the aromatic soluble. Thus, cold coffees are less aromatic than conventional hot brews. The Perfect Brewing Methods Ensure the Best Flavors, Aroma and Charm! The two key elements determining the charm, flavor, and aroma of coffees, both cold and hot brews are – temperature and time. Appropriate brewing methods are implemented to bring out the best in cold brews and hot coffees. The chemistry of different brews impacts the taste and feel of the beverage. Keeping this chemistry in mind, coffees are tailor-made to suit customers’ unique tastes. Some of the best and freshest cold brews are served at cafes and restaurants all over. These iced coffees are available in bottles and on taps. The best coffee shops seek to provide quality beverages with indigenous ingredients which add soul to your cup. Discover the realm of infinite possibilities that coffee can offer! What could be better than a hot cup of freshly brewed coffee for kick – starting your day? The magical aroma and the taste, tickle your senses and give you the energy boost you need to start yet another glorious day. Most people wake up and look forward to ‘smell the coffee’ and sip it after a restful night’s sleep. A hot cup of coffee keeps you warm and calms frayed nerves, while a glass of soothing and delicious cold coffee can make a great difference at the end of a hot sultry day. Next time your boss is on your head or wife is after you, go for a cuppa’ coffee – hot or cold! The first thing in the morning that people around the world crave for is coffee; the first thing they ask for in the middle of the hot summer day is a glass of cold coffee brew. Hot coffee drinkers: This is your normal coffee with which you start your day. Most people prefer the regular hot coffee over a cold coffee. This is especially true for the first cup in the morning. The warm and nerve – soothing taste cannot be replaced by a cold coffee. Cold Coffee drinkers: A specially blended coffee normally served in cafes, restaurants, club houses, and other places where you can order a glass-full. It may be served in different forms or with many different add-ons, like ice-creams. Cappuccino: served as a shot of espresso topped with steam-foamed milk. Cafe Latte: A lighter coffee, made with a shot of Espresso with milk added. Aztec Coffee: This is a gourmet, international blend that has a double shot of espresso made from a blend of coffee beans and topped with steamed and frothy milk. Regular Filter Coffee: This is the traditional South Indian Coffee that is strong and aromatic. It takes you back to the lush coffee plantations in the coffee growing region of Chikmagalur, Karnataka state, India. Cafe Frappe: The original cold coffee which is a rich and creamy cold coffee with an endearing taste. An all-time favorite beverage of all coffee drinkers. Almond Rabdi Frappe: This is a concoction made with rich rabdi, a shot of smooth, whipped cream and topped with roasted almond flakes. Citrus Cold Brew Coffee: Brewed coffee, blended with Mandarin flavor served in sugar – rimmed cup. Experts who know their coffee, source only the best coffee beans from Coorg and Chikmagalur in Karnataka state. It is also sourced from Araku Valley in Andhra Pradesh. This area is a non-traditional coffee growing region. Here, the local tribal communities have taken to producing coffee of a premium quality and are free from pesticides, thereby offering pure coffee beans that have a personality of its own. According to the Coffee Board, the total coffee production across India – for both Arabica and Robusta blends was estimated at 348, 000 for the year 2015 and 2016. Years of research has revealed that coffee is not only a pick-me-up drink but has therapeutic values. Coffee is not only a versatile beverage – it is also a health drink that will add years to your life. So, here’s to Coffee – Cheers! coffee, Citrus Cold Brew Coffee, Almond Rabdi Frappe, Cafe Frappe, Cold Coffee, Cold Brewed Coffee, Regular Filter Coffee, hot coffee, brewed coffee.